Happy New Year from the Yale Law Library Rare Books Blog! The Lillian Goldman Law Library’s 2013 holiday card features an image from one of this year’s acquisitions. 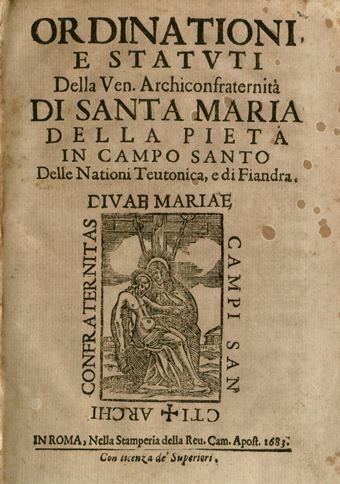 The image is the headpiece from the opening chapter in Friar Lorenzo Mascambrone’s Degli asili de’ Christiani ragionamento (Roma: Camera Appostolica, 1731). The book is a vigorous defense of the Catholic Church’s right to grant sanctuary to fugitives, published at a time when Catholic governments were protesting that the Church was coddling criminals and traitors under the guise of sanctuary, and thus threatening public order. Exhibit talk: Bryan Garner on "Built by Association"
Bryan A. Garner, the world’s leading legal lexicographer, will give a talk on Monday, December 9, about the exhibit of association copies from his private book collection, which is currently on display in the Lillian Goldman Law Library, Yale Law School. Garner, Editor in Chief of Black’s Law Dictionary, has amassed a private collection of 36,000 books. He is particularly drawn to “association copies,” books once owned or inscribed by their authors or other significant individuals. The inscriptions, says Garner, are an “ineffable connection” with those who once signed or owned the book. Garner’s talk is scheduled for 1pm on December 9 in Room 128 of the Yale Law School, 127 Wall Street in New Haven. A limited number of exhibit catalogues will be available for those who attend the talk. 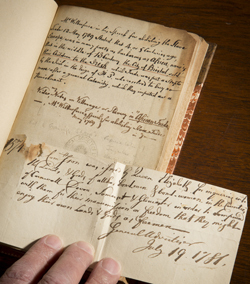 The exhibit, “Built by Association: Books Once Owned by Notable Judges and Lawyers,” includes books inscribed by John Jay, the first chief justice of the U.S. Supreme Court, and Clarence Darrow, the most famous trial lawyer in American history. Other notable figures include Supreme Court Justices Oliver Wendell Holmes, Jr. and Benjamin Cardozo, and Lindley Murray, a lawyer best known as “the father of English grammar.” Three of the authors taught at Yale Law School: Supreme Court Justice William O. Douglas, Judge Jerome Frank, and the iconoclastic Professor Fred Rodell. 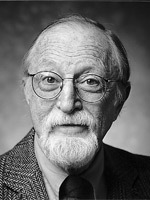 Garner has been editor in chief of Black’s Law Dictionary since 1996. He has authored many other standard reference works in legal lexicography and legal writing, including Garner’s Dictionary of Legal Usage (3d ed. 2011), The Elements of Legal Style (2nd ed. 2002), and The Redbook: A Manual on Legal Style (3rd ed. 2013). 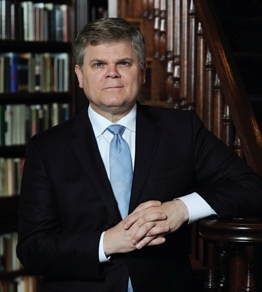 He is the co-author with U.S. Supreme Court Justice Antonin Scalia of Making Your Case: The Art of Persuading Judges (2008) and Reading Law: The Interpretation of Legal Texts (2012). Garner is also the author of Garner’s Modern American Usage (3rd ed. 2009), published by Oxford University Press. Garner is the owner of LawProse, which conducts seminars in legal writing around the world. He is also Distinguished Research Professor of Law at Southern Methodist University. Garner curated the exhibit, with assistance from Mike Widener, Rare Book Librarian in the Lillian Goldman Law Library. The exhibit is open to the public, 9am-10pm daily, through December 18 on Level L2 of the Lillian Goldman Law Library, Yale Law School. 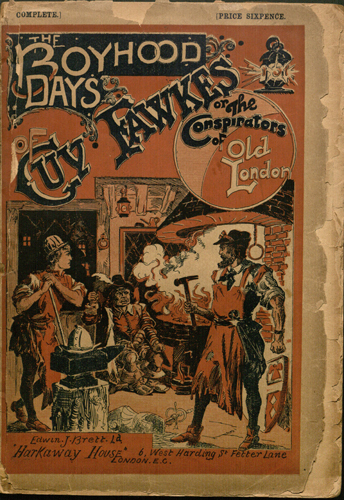 R.J. Lambe, The Boyhood Days of Guy Fawkes, or, The Conspirators of Old London (London: Edwin J. Brett Ltd., “Harkaway House”, [1895?]). Gift of the late Professor Morris L. Cohen. A specimen of the “Penny dreadfuls” genre of popular literature, from the Juvenile Jurisprudence Collection, Lillian Goldman Law Library. The latest addition to our Flickr site is “Dutch legal dissertations”. 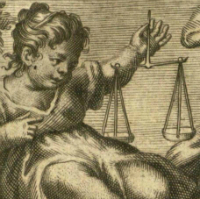 This set of images is another product of my interest in illustrated law books. The Lillian Goldman Law Library owns thousands of dissertations for doctorates in law from the 17th-18th centuries, most of them from German universities. The title pages of the German dissertations tend to be fairly plain and text-heavy (see the “German legal dissertations” set on Flickr for a taste), although the woodcut headpieces and initials can be quite pretty; you can view several examples in the “Justitia - initials” set. 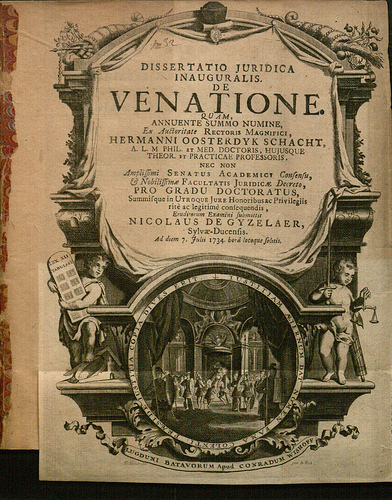 However, almost all of the 18th-century Dutch dissertations have ornate engraved title pages, like the dissertation on hunting law shown here, one shown here, Dissertatio juridica inauguralis: De venatione (1734), submitted by Nicolaus de Gijselaar for his doctorate in law from Leiden University. Note that the title page is larger than the rest of the 24-page pamphlet. This is another common feature of Dutch legal dissertations. One hypothesis is that the title pages did double duty as broadsides advertising these important academic events, where the candidate would formally present his dissertation to the assembled faculty and dignitaries. I have yet to find the same engraving re-used in another dissertation. This indicates both the prosperity of the Dutch Republic and the importance placed on the dissertations. At this writing, “Dutch legal dissertations” contains images of only 10 dissertations, but more are on their way. I am scouring the uncataloged dissertations for additional examples.